Hi everyone happy Friyay! I’m writing this post earlier than normal as I’m actually off out tonight with work, byt the time you read this I will probably be feeling rather sorry for myself. 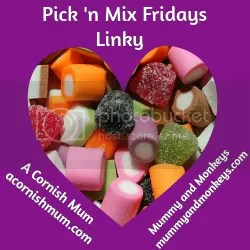 Pick ‘n Mix blogger’s linky link up run by myself and Stevie at A Cornish Mum has a had a redesign and some changes so please make sure you read on to find out. The first change you will notice is our lovely new badge which they talented Stevie has made. You can still grab the code at the bottom of this post. My favourite post from last week who can grab the badge above if they want was How to not make an Easter Nest with Toddlers by R is for Hoppit. Such a funny read and so true if you have ever baked with toddlers. We previously changed it to make sure everyone got at least one visit and comment other than mine and Stevie’s ones, by saying that you should comment on the blog post before yours. This we are keeping, to try and keep things fair. 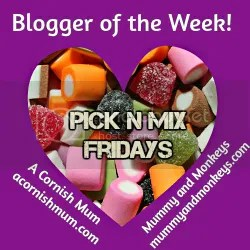 Please remember though, that even if you don’t get many visits or comments from people through Pick ‘n Mix click throughs, we do retweet you which helps to get your blogs out there to others. My Twitter followers are over 6000 at the moment and joined together with Stevie’s you will be retweeted to over 18000, and if you get chosen as our favourite blog from that week you get a shout out on the next week’s post including a follow link. ALSO another change, some of you may have heard/noticed that Stumbleupon is becoming really popular with bloggers because of how many site views it can potentially provide. Each week Stevie and I will be stumbling half each of your posts that you link up as well, so that’s even more exposure for your blog. If they have already been stumbled we will give them a like. "DaniPro Nail Polish review in Coral perfect for Spring"